You tax dollars at work, Seattleites. 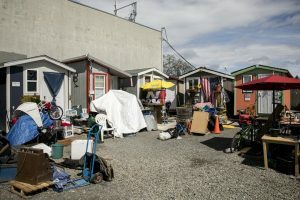 Seattle bureaucrats continue to try and solve their homeless crisis keep the homeless industrial complex alive. In 2017 they opened the Licton Springs tiny home village which is a “low barrier” facility meaning residents can freely drink and do drugs. I couldn’t find the exact cost of Licton Springs but found that the city will pay the Low Income Housing Institute (LIHI), an affordable-housing nonprofit, a combined $1.75 million this year to operate six of the city’s villages, including Licton Springs, with SHARE/WHEEL and its sister nonprofit Nickelsville as partners for on-the-ground staff. This entry was posted in crime, Insanity, Liberals/Democrats/Left, Taxes, United States and tagged homeless industrial complex, King County, Licton Springs tiny home village, LIHI, low barrier homeless shelters, Low Income Housing Institute, Mayor Jenny Durkan, Seattle, Seattle City Council, Seattle Police, Seattle's homeless crisis, SHARE/WHEEL, Washington State. Bookmark the permalink. You mean to tell me that this didn’t work? I’m amazed (not!). Whenever large numbers of anti-social people congregate the situation is ALWAYS improved by concentrating them and spending bags of taxpayer money. Just think how many long rides out of town $1.75M would buy. What do you mean it didn’t work? Crime went down in the surrounding area….. because it became concentrated in one area. What failed is the seattle brain trust didn’t some how take advantage of all those homeless being in one place. Re: $1.75M worth of rides out of town. Ever notice no matter how much taxpayer money goobermint confiscates and spends to fight poverty, poverty continues to survive? Giving money to drug addicts and the mentally ill will always ensure a certain percentage of the population will remain living on the streets – or in other people’s backyards.